A look at the single life and dating - after age 30! Who would have thought it would be like this?! When it comes to dating, other than just giving up... I've been worried that I simply don't have the tolerance for the mundane conversation required. Maybe I've lost my mojo. Maybe I'm just not interesting any more. I hate talking about work. Why does everyone want to talk about work? We work to live, people. Not live to work! Let's stop making it so important. I've never really been good at flirting. At minimum, I can flirt with someone I'm interested in, but I can't flirt for the sake of flirting. I know women who can. Not too long ago, I went out with a friend who is twice divorced and frantically searching for her next husband. She ended up spending the whole evening talking with two men over 60, who she wasn't interested in, flirting with them! I could barely even act polite after the first 10 minutes! Eww! Anyway. Lately I've felt like the art of conversation has been all but lost. Maybe it's just me. Maybe I'm the boring one. This weekend, I was invited to dinner with some older couples. They had a man to introduce to me. I only went because they asked. I didn't have high hopes. But before that dinner, another couple had a little get-together at their house, and I was able to swing by for almost two hours. At their party, I met a nice young man (probably too young for me) and we naturally started a conversation that moved easily from one topic to another, each of us speaking in equal portion, laughing, smiling. He picked up on my animated nature, even stoked it a little. We talked about our interests, mostly his... but we did not talk about our jobs at all. It was so nice. And I thought. Wow, I'm glad I came, because this is good practice for what is likely to be a dreadful evening. Then I went to my set up. The man they had for me to meet was kind and polite. But making conversation was a struggle. He talked about his job and asked about mine. And the conversation stagnated. We sat next to each other all evening, but it was all awkward. At one point, he said something interesting that caught my attention. That he was planning a vacation and was looking forward to scuba diving. "Scuba diving. Wow," I said, "I've always wanted to do that! Sounds like you've done it before!?" Yes. He turned to respond to another guest. Whomp woomp. Dude. Time to talk about this activity you're passionate about! I just expressed interest in your interest! Roll with it! Not another word was said about it. As conversation moved around the table, even I had to work hard to interject... the married couples sort of dominated the conversation. Mr. Set Up had nothing to say. And that's fine. Not everyone needs the center of attention. Not even me. But I do expect someone, a grown, adult man, to be able to contribute to the conversation. My evaluation of this dating prospect was that he's not very outgoing. Almost timid. And if you've ever met me, it's hard to imagine me with someone who is not outgoing. So I'm not going to feel bad for not being interested. As I drove home, after he kindly walked me to my car in our friend's driveway, and opened my door... I thought about how easy it was to talk to the guy at my friend's party. How conversation just flowed as conversation is supposed to. Even if we're not interested in each other, it was nice to know that IT'S NOT ME! Maybe the dates I've been on really were THAT BAD. I don't have to blame myself for failed conversation. Sure. Maybe I could work harder to coax conversation out of someone, to push for their interests and draw things out them. After all, I interview people for a living. But even then, there are interview guests who don't know how to respond to questions, and I find myself treading water for both of us! On a date, with grown, adult men, I shouldn't have to coax conversation. If they haven't learned how to talk by now, it's not my job to make them social. Thank goodness for that conversation with an interesting guy, or I would have thought it was MY failure. Again. I think I'm living with the worst haircut I've had since my college years. I just can't do anything with it, and in the past three months, I've just given up even styling it, because my best bet is letting my natural wave take over, which makes it look like I tried. Actually trying, yields much worse results! My stylist is fantastic, which makes me doubly upset about how this turned out. She just cut my layers way too short at the crown of my head, and it's going to take months before my hair will be back to normal. 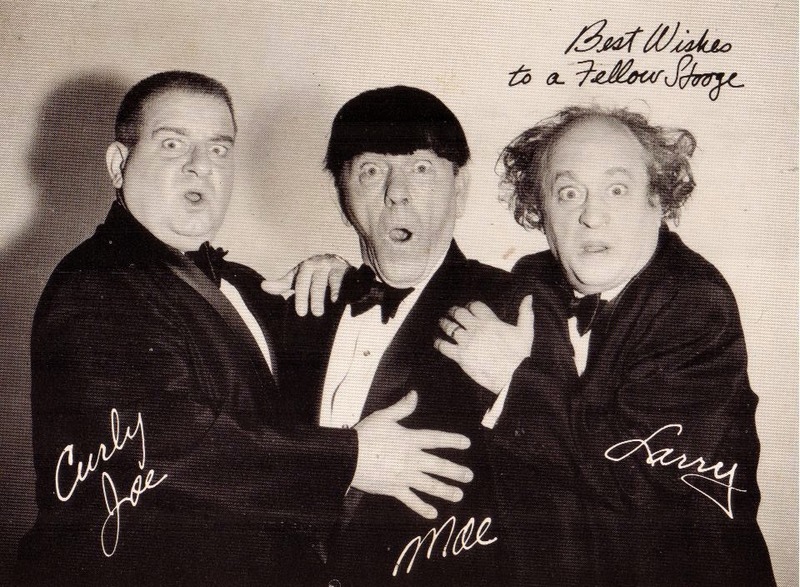 Now, if I pull my hair up in a scrawny ponytail, the hair you can see from the front makes me look like one of The Three Stooges... Moe, I guess. Actually, it looks more like this... when the length is pulled back. Looks great on Matthew Macfadyen, not so much on me! One of my dear friends has always envied my hair, which is thick, healthy lays nicely and is typically easy to manage. She's very upset about my hair, which is actually a comfort! She's said, "How dare anyone do this to TRS's beautiful hair!!" The same friend who envies my hair, (she acknowledges it, it's amusing to both of us, I'm not being vain here) does so because hers just doesn't grow as she would like it to. Last week, when we met up with some other girls for dinner, I noticed hers is suddenly quite long, and commented on it. She was so proud that I noticed! I asked if she was taking prenatal vitamins or something, because the difference was dramatic - and as I asked, I noticed a new girl in the group made a face when I said the word "prenatal". I'm not even surprised. Our culture is so anti-baby - anti-new life, that the very thought of preparing for pregnancy is somehow mortifying. To suggest that someone would take nutrient-rich vitamins that happen to be beneficial for reproduction is almost... insulting. I knew instantly what that expression meant. And I've been disturbed about it for a week. My team at work is engaging in a delightful kind of silliness. It started about a month ago, when complimenting someone's work, I said, "You're the best!" and someone chimed in with... "Around!"... mimicking the song from The Karate Kid. It has reached ridiculous heights now... someone marks a small achievement or does someone a favor... and we break into song... "You're the best... around! Nothin's ever gonna keep ya down!" One co-worker has declared no more superlatives. From now on everything is just "good". Bah. We're singing. We've even put other compliments to the same tune. Sometimes a conversation at work can help you appreciate your single status. An older co-worker, who has a silly, youthful attitude, tends to stop by my desk to share non-sequiters with me. This week, he shared his enthusiasm for the new insoles he put in his sneakers. I'm all about insoles... they can really make a difference. But he made me suspicious -and I asked him to show me the bottom of his sneakers. As I suspected, they were tread-bare (if that's a word) - completely worn out!! I said, Dude, you need new shoes! Those are worn out and insoles can't help replace the support you've exhausted! It's a routine with us, we just give each other a hard time, smiling the whole time. He muttered about the price of shoes --- and I reminded him that he has a good job, he can afford shoes! Considering how worn they are, he hasn't replaced them in two and a half years! Then he muttered about having a wife who spends all their money. I drove home that day appreciating the fact that I can buy workout shoes when I need them, without consulting with anyone else! Also realizing, that the whole conversation was less about what he could afford, and more about control issues. He'll probably go home and tell his wife that she's the reason he can't have new shoes. Even though he surely has the latest gadget in his entertainment system. All of a sudden I can do ten pushups in a row. Real Army-style pushups! Only toes and hands on the ground. You should have seen my trainer! Where did this come from?! My max was three and suddenly I did ten! It was nuts. Not sure I can do it again, but I did it. My car has been being naughty lately. Actually the truth is, I was neglecting her. I finally realized she needed power steering fluid, no wonder she was whining. The other day, I stopped at an auto parts store after work to get some. Walking in such an establishment wearing a knee length skirt, you turn some heads! A fellow customer actually commented, "You don't see many women coming in here, dressed all professional, buying engine fluids! I'm impressed!" I couldn't help but think, what do other women do? Is this really impressive? To me, that's like being impressed that a man bought laundry detergent. Don't we all drive cars? Yes, I popped the hood, and put the fluid in, all while the same guy watched. I think he doubted that I'd get it in the right place. I'm pretty sure I heard his head explode. I'm thinking maybe I should pick up some prenatal vitamins to force my hair to grow back out quicker... but I hear they're pretty expensive. Joining up with Conversion Diary for Quick takes! Oh Easter. I have become so weary of the secular take-over of Christian holy days. 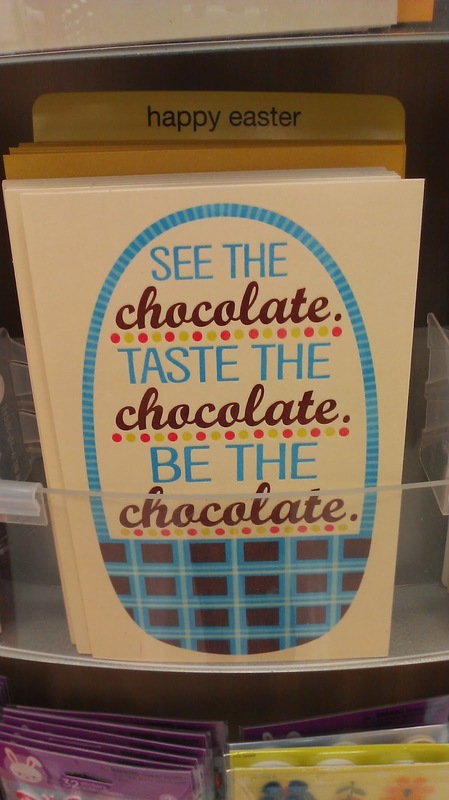 As if attitudes surrounding Christmas aren't bad enough, now they're secularizing Easter! Easter which celebrates the resurrection of Christ, the entire meaning of our faith!!! It makes me so sad. Easter is not about chocolate! Is there someone who is sincerely sending an Easter greeting to a loved one, who doesn't want to cross the line by mentioning Jesus? Right after I snapped the picture above with my phone, a favorite, funny friend sent me this random picture via text. What store is she in? Is there a sale on plungers? A neighborhood with septic problems that has everyone running out for plungers the way most cities have had a run on shovels this past week?! Why wonder? I went right to the obvious question: "Are those chocolate, Easter plungers?" My city just got it's first Tr@der J@e's. I have two words… Cookie Butter! Oh the yum! It seems so very naughty, but the nutrition facts aren't all that different from the Almond Butter my trainer has suggested as a replacement for sweets… the major difference being the protein content. Which is, yeah, a major difference! Most days I feel like a bag lady. Between my purse, computer bag and a workout bag, I'm never arriving home with my hands empty. On the days I work out, obviously I have take my gym clothes in to work. It's not good to expose your athletic shoes to extreme temperatures, so I can't leave the bag in my car. One day this week, I was also planning to go to a class after work and needed to pack some food to get me through to 8pm before I can get home... so I looked like a beast of burden as I trudged out the door! Five bags. It was. Ridiculous. Then a co-worker came by my cubicle and made fun of the pile of bags. I explained, "This is my purse, my computer bag, my gym bag, lunch, and another bag has books for a class tonight." Feeling justified until he smugly pointed out that he carries one bag, each way, every day. "What if you started working out? Would you have to carry a gym bag?" I asked, pointing out the necessity of such burdens. "That's never going to happen, so no." he replied, with a little smile indicating he's quite happy being soft and doughy. Because our relationship is built on snark and sarcasm, I smiled back and said, "Meanwhile, I look like this...." using my hands in exaggerated Vanna White fashion to indicate my form. He countered with, "Meanwhile, I look like this!" doing the same to indicate his beer belly. "And I have this." he said, indicating his wedding ring and the fact that I don't have one. "Which is precisely why I have to lug bags around so I can look like this!" I said, once again acknowledging my form in a slightly defeated, yet dignified way. I had a little party last weekend, just a few ladies over… including some who have kids. I was a little concerned, because my place is rather small, and not exactly accommodating for children. But I wasn't going to NOT invite certain people because they have children. And I would have been greatly disappointed if they had responded with the standard, "I have kids, I can't." So we ended up with two moms and their two kids each, and a handful of single ladies. It was really great! Everyone enjoyed one another and the kids all played well together. I have a small box of toys that I brought out to entertain the smallest kiddo - and someone said, "How do you have toys?" As if a single woman isn't allowed to have toys for entertainment purposes! I just smiled and said, "I have toys. It's part of being a good hostess!" That seemed to satisfy everybody. One of the moms at my party is a dear friend who makes a real effort to include me in her family and be a part of her kid's lives. Her little daughter is very precious to me, so I was beaming when, in response to her daughter sticking to me like glue, following my every move… she said, "My daughter loves two people. TRS and my youngest sister." I added, "If we were both in the same room with her at the same time, her head might explode!" It was pretty cute, as they haven't been to my home since having another baby, my favorite toddler was kind of amazed that Miss TRS has a home! "Is this your room? Is that your closet?" Joining up with Conversion Diary Quick Takes linky. Sigh, it seems Quick Takes are the only blog posts I can manage these days. I have so many ideas, but no time to write. Someday, my pets, you'll get all the wisdom I'm storing up in my lazy typing fingers! Does anyone else find it amusing that fast food restaurants are advertising their fish menus right now... because, February! Yeah, Lent doesn't start until Ash Wednesday on March 5th... but the ad campaign geniuses don't seem to know that. Oh, maybe it is just fish season. One of the fast food restaurants near my work only sells fish and chips during lent, and most of their employees don't even know it. It's not on the menu board. I only found out they had a fish option by scouring online last year during lent - then went to order it and seriously threw them all for a loop! Shortly after Easter they eliminated it again, and they didn't seem to know why. I tried to explain about lent but they had never heard of it before! So I'm wondering how it will go down this year, with lent starting so late - will they stop carrying fish in mid-March just after lent starts? This is just how secular our country is becoming. All those F@ceBuch Look Back videos were fun this week, huh? It really was neat seeing all the great highlights of some friends. Not for me though. I watched my preview, but my most-liked posts were my dad's death, and an observance of what would be my sister's birthday... (she died nearly 30 years ago). That and the fact that the first pic to come up was not of me, and another one was of a friend who I'm no longer friends with. All the other pictures were of other people's kids. So that was awesome. Way to make single look good! That was uber depressing so I didn't bother to post mine. Nice way to feel like a loser. Everyone else had engagements and weddings and babies or anniversaries - you know, life milestones. Mine was about everyone but me. Which, my bestie pointed out, is rather representative of my life, which is more about others. But still. Total downer. Extra weird, I have a friend who got married and divorced in a matter of months, and somehow neither her ex nor the wedding pictures made it into her video via the most-liked posts formula. But the most depressing moments of my life did. How does that work?! Knowing those videos were based on the last five years -- reminds me that a recent date (yeah I gave up dating, but I told God I would be open to any men He dropped in my lap.) asked me, "Where do you see yourself in five years?" Oh sheesh. As if first dates don't feel enough like job interviews!! I was a bit stunned by this odd question, but managed to say that I didn't think that was fair question at our age. Being over 40, nothing in my life is really going to change unless I get married. I have to work to support myself, and it's not likely that any other business in my industry is going to hire someone my age when they can get kids fresh out school, and trained on the latest technology for less than what I'm paid now, which isn't all that much. So I'll be working where I am for as long as I can. I have a mortgage that I can't refinance, so I'll be living here until I either win the lottery, die or get married. I can't really have or adopt a child on my income and work schedule... so yeah, my five year plan, not much change or excitement unless God drops that man in my lap. Not really a fair question of a middle-aged woman with no prospects. Whomp whomp. Somehow, a conversation in the office about government and politics turned to the young co-workers discussing precautions they're taking in the event that the U.S. government becomes unbearable and / or really starts attacking Christians and Catholics more severely than they already are. They talked about how they are saving money and having funds in another country that would be accessible even in some sort of freeze. My first thought, these kids must have access to trust funds or other generous contributions from their families. My second thought... "Wow. I am scr@wed!" I will be broke, with no options, and no one to care for me. So I guess I'll just prepare to be a Catholic Martyr! Okay... happier thoughts. How about bubbly?! I am a fan of bubbly water, so last year I finally bought a SodaStream so I could make my own carbonated water and stop hauling bottles of Arrowhead home from the grocery store. I love my SodaStream! When the CO2 runs out, you can return it to a store, and get a refill canister for half price. Half price is $15. I'd been going to TarJay, but the last couple times, they were out of refills, making it a bit of a hassle. This was the case last night, and they suggested I try B@d, B@th & B@yond. Despite how terribly cold it was ( -9 degrees), I drove a bit out of my way, hoping I had a BB&B coupon in my driver's side door pocket (I find that's the best place to keep them since they don't expire). Luckily, I had a $5 off coupon, which applies to a minimum $15 purchase... so yes... refills are $10 instead! Whee! Why didn't I think of that before?!! For the past week or more it's dipped below zero a few mornings and evenings. But being Denver, it hits 35 or 60 at about lunch time and I end up waddling around in my giant parka!! The Olympics!! I'm not a huge sports fan, but there is something about the Olympics. When I was a kid, I was always intrigued by the profiles on the athletes. That reporters actually got to interview these Olympians and their families... to tell their stories of struggle and determination, dedication. That just seemed like the best job in the world to me. That was the first inkling I had to be a journalist. So I just discovered that one of the new characters on Downton Abbey is actually two characters. Why are the downstairs scenes so DARK?! Last weekend, a sweet friend of mine posted a picture of a homemade waffle, fresh out of the waffle-maker. So fresh off the waffle press it was actually still on the waffle press! And my first thought was, "Wow! You can eat carbs?!?!?!?!?!!" My second thought was, I have become Emily, from The Devil Wears Prada who is upset that Andy is going to Paris Fashion Week in her place, getting all the fabulous designer clothes... after all, she says, "You don't deserve them, I mean you eat carbs, for Chrissake!" Yes, that is what Paleo has done to me! I think I finally have enough clothes for the winter season. She says as lent approaches, and spring closely follows. Sheesh, what is it about me that has two closets full of clothes, yet I have nothing to wear? I'm trying really hard to cull my wardrobe. It's hard for me to get rid of anything because I don't buy it unless I like it in the first place - so why would I get rid of it? My real problem is that I tend to buy individual pieces, then struggle to make outfits out of them. So as much as I have told myself to quit buying clothes woman, you need to save money! It's always just this one thing to complete this one outfit. That and the fact that I struggle with finding jackets and blazers that fit without a ton of alterations... so when I found two jackets that accommodated what must be my freakishly enormous shoulders, but still fit around the rest of me that is considered by most to be quite small... I was compelled to buy them since they were only $25 and $15 each! The problem is, that set me off on finding a top to wear under the houndstooth jacket. And the problem with shopping for one thing is you find other things. Vicious cycle. Anyway - now I feel my cold weather wardrobe is complete now that's February. May the sweet baby Jesus help me when it's time to rotate to the spring/summer wardrobe! Speaking of wardrobe... a friend had a clothing swap party a couple weeks ago. We all cleaned out our closets, then brought our goodies to her house and picked whatever we liked. Anything left over was going to a local thrift shop. What a great idea! It was fun too. Even better, I was able to get a few new-to-me items, that when I brought them home - miraculously went with several things I already had. Completing a few more outfits, or at least, giving some other items more play in the rotation. If culling my closet was supposed to be the goal, then I failed. If it's being happier with what I have, I succeeded! The real bonus was being able to try some looks that you wouldn't normally invest in, but if you're getting it for free, you'll give it a go. A conversation with my bestie gave her a chance to unload some concerns about just how she's fulfilling the roles of wife and mother. She had a rough couple of days. I told her that the fact that she's working on repairing the damage is proof that she's doing it right. I know, as a woman without a husband or family, that it's easy for me to picture sunshine and rainbows - and even though I know that's not so - I'd still rather have a rough day as a wife than a mediocre day alone. I shared that thought with her, waiting for the kind of correction I get from most marrieds... the old "Marriage is hard" refrain. (as if being single For. Ever. is some piece of cake!) Instead, she replied, "I know what you mean. I was single for a long time. I would never want to do it again. Being single is definitely harder than being married." A couple days later, another friend who has been married just over three years - reinforced that message. First by saying that she thinks I'm handling an extended period of waiting better than she ever handled hers, and hers was shorter - and mine just keeps extending!! When I told her what my bestie said, she agreed, she would never ever choose to go back to being single. I guess there's no real conclusion for that thought. Just stating real facts. Visiting a friend for dinner, she got out a jar of pickles she canned herself, for us munch on until dinner was ready. She opened the sealed jar, slid it across the counter to me and just as I went to fish out a pickle with my fingers, she handed me a fork! Wow! A fork to get a pickle out of a jar? How fancy! Oh no, I wasn't using my fingers, I um, slipped, yeah I slipped. Yeah, living alone for a lot of years will drain you of common decency I guess! How is it we can stay in touch with friends who live across the country, but someone who lives on the other side of the city falls completely off the radar? A sweet friend just had a birthday, and asked me to join her and some friends out for dinner and live music. Once we met up, we had a great time. She even pointed that we have that great quality where even though much time passes, the minute we're together, it's as though no time passed at all. Those are the BEST friendships. When you can pick up right where you left off. I have many friends like that, and it is one of the greatest blessings on this earth. Now we just have to make an effort to get together more often! I'm deep in the mystery of the disappearing favorite work out shorts! How is it possible? I live alone, I don't have any pets that could have wandered off with them. Sure, I use a common laundry room downstairs with the rest of my neighbors... but I know I hung them to dry over my bathtub, next to my other favorite pair, and moved everything to my bed the next morning before my shower. They disappeared sometime between then and coming home from work! Must be the same culprit who messes up my house while I'm work. Sleuthing tips welcome. We gotta get this evil genius! After seeing the results of my sugar fast (flat tummy, which has now disappeared because I have so totally rediscovered chocolate!! Bah!) one of my friends is now doing the same sugar fast challenge. The frustrating thing about it is, it takes a while for results. I mean, there you are denying yourself sweets of all kinds, and you want to see results NOW! She's been texting me for moral support, and about every other day she asks when she's going to see results... because honestly... truly... you look down one day and your tummy is gone! Well, it's been a couple months since I did it and I truly couldn't recall just when I noticed the personal miracle. I was pondering this question while running errands, and suddenly I remembered!!! I grabbed my phone and texted her back, "You'll see the results right about when you stop craving the sweets, and you no longer have a desire to cheat!" My life is a little bit sweeter these days because Downton Abbey is back! Although I want to pluck Julian Fellowes' beard if he has one, for continually mucking up the lives of my favorite characters. I do love the show, but I'm really peeved with the Brits take on drama which is to kill off favorite characters and throw gigantic wrenches into story lines! While watching the season premiere, I thought to myself, "Gosh, I love Carson." - smile, smile, happy thought - "I hope they don't kill him. Heck they'll just realize he's old and let him die of natural causes!" I hate that something I love so much makes me think this way! You know how some things just need to change with times? It has occurred to me that if Author Gary Chapman were to rewrite The Five Love Languages, one of them should be Comments on Facebook Posts. Seriously. Likes are just too weak. I admit it, my self-worth is wrapped up in the need for comments when I post something pithy. Like? Meh. If you liked then you shoulda put a comment under it! I'm so frustrated with the stops and starts trying to get my house back in shape! I've been trying to purge a few things. Old files, small appliances, some clothes and shoes that I'd like take to a resale shop... I have some foot issues, so I've been buying shoes like a maniac trying to find something that doesn't hurt my feet, that are cute but can still fit an orthotic foot support (IMPOSSIBLE!). I made a lot of mistakes last year in that department. Shoes that feel pretty darn good on a test drive in a 640 sq ft apartment, don't maintain that level of fabulous walking around in real life! So I need to get some money back for shoes that have only been worn once or twice. Problem is, until I figure out which resale shop, or whether to put on ThatDudesList... all this stuff is piled up in my hallway. No matter how clean the rest of the apartment, it looks messy thanks to the piles. Boo. I think I have determined that I must start by finishing some sewing projects, so I can put the sewing machine away... (that thing just makes my whole living area look discombobulated!) then I can purge the piles.... clean out more closets... and then maybe I can finally relax when I come home. Any tips? Today I read a tip that suggested once a person reaches age 55, they should start going through all their belongs and purge anything that would be a pain in the tuckus for friends or family to have to go though should you meet an untimely demise. I'm not sure how I feel about that. 50 isn't too far off for me (far enough, thank you very much) and I feel like I still haven't gotten to experience much of my life yet. No husband, no kids. There are some things that I own that I very much hoped my children would remember me by. "That beautiful credenza? It was my mother's. She had great taste in furniture, and saved and saved to buy everything she had. She loved antiques and Mid Century Modern, and she could dicker a price down like nobody's business... a skill she learned from her dad. It reminds me of her every day." I mean, I JUST NOW got my apartment the way I want it, and this article suggested that no one will appreciate my stuff but me. Sure, I'm probably never going to have kids, and my family could care less about the kinds of things I appreciate. But I kind of want them all to sort through my things and learn who I was. Since they didn't really bother while I was alive. No matter, I've told my BFF that if I die suddenly, she needs to get here before my mom does and tidy up! In exchange, she can have all my furniture because she's the only I know who would appreciate it! Have I told you how much I love eating fish since I got the all clear from my allergy doc two years ago? Yeah, I spent 20 years of my life avoiding all fish and seafood because doctors were concerned about the risk of cross-contamination from shellfish, which really has it in for me. Well, about two years ago my doc told me I could have most fish if I could verify that it's been kept a safe distance from shellfish. In the years since that initial diagnosis, the commercial food prep standards have become stricter and the risk is quite minimal now. Let me tell you, it's about all I eat. I love it. (but not too much to risk mercury poisoning) It seems like a luxury after denying myself for so long. Any menu I see, I look for the fishies and indulge! Whee! In fact, that's what several of my tussles with my mom were about when I was home. She jumped on me anytime I ate or ordered fish. "If I were you, I wouldn't take that risk." It's not a risk mom, it's fine. I've been eating fish regularly for two years and I'm still alive. I've done my due diligence. For crying out loud, I'm a grown woman, I think I can choose my own meals. I think it was exceptionally frustrating because I live alone, and I'm not used to anyone questioning my decisions on a daily or hourly basis. It was so weird to have my food choices second guessed. Sheesh! And the reality is, the only times I've ever almost died were when there was actual shrimp in my meal, that I wasn't told about. Where in fact, I expressly ordered something shrimp-free and they snuck it in. I've never had a reaction from cross contamination. Only from the sneaky little buggers themselves! So yeah, Salmon? Wahoo? FishNChips? Bring it on!!! I'm so much healthier now too! Looking back on 2013.... I guess it was a fairly good year. Not as traumatic as 2010, which was the NYE I stayed home and went to bed at 9:00 just so the year could be over as soon as possible! This year, a dear friend had a simple, low-key party at home - it was perfect! My best accomplishment this year was getting fit! Friends have been pointing out what they see as my noticeable weight loss. I did lose a few pounds, but only a few... however, thanks to dietary changes, and Crossfit workouts, (I gave up wheats and grains more than a year ago, went sort of paleo, and just before Thanksgiving I gave up sugar and dairy) I have redistributed my weight in a far more desirable fashion! I am very pleased with the changes. On New Years Eve, an acquaintance saw me and waxed astonished about my transformation. Apparently, it looks like I lost a lot of weight, although I didn't even lose ten pounds, and I'm still fluctuating. I think the change seems dramatic because I lost belly fat due to the many changes I listed in italics, so my tummy is flatter than ever... clothes look SO much better. I have been struggling with obtaining a flat tummy for years! A few years back, I told McTwitchy that it was one of my biggest insecurities. He, of course, would always tell me that I looked great... he did not see the fat tummy that was so obvious to me. Last week, I bragged a little to him and pointed out that my tummy was finally flat. He sees no difference, shrugged and said, "Believe me, no one is looking at your stomach." I just stared at him, shocked, and said, "That's a really mean thing to say! Geeze, do you men have any idea how much work we women put into having a flat tummy?!" Oh well, I know men don't really notice that stuff, but to say that all my work isn't even noticeable seems a bit harsh. Even though I know that he's really saying there are other features men notice before abdominals. I get it. But still. That's okay, I did it for me anyway! My biggest failure this year was an attempt to refinance the mortgage on my condo. There are certain FHA restrictions on buildings like mine, that negatively impact eligibility for loans. I'm fully aware of the potential problems, and explained it all to the mortgage agent upfront. So when they put me through months of information and finance gathering, I really thought it was going to work out. Seriously, they traumatized me for four months, making me believe the refi was actually going to go through... then at the last minute they declined it for the very reasons I told them I was concerned about when I applied for the loan! Literally, the very last minute! An exercise in futility! So much time and effort wasted. Ugh. It still makes me mad to think about it - and I'm not ready to try again just yet. I also quit dating this year... After the last guy who seemed he could only be a perfect fit ... bailed out like a coward. No really, he was Catholic, divorced, but annulled before he ever pursued dating (yay, gold standard! ) and has college-aged child, so there was an empty nest with potential for me to be a grandmother, since I never got to be a mom! Whee! So anyway, no dating for me. I mean, I will date, but I'm not going to care about it. When I was home at Christmas, I ran into an old high school classmate. Someone who got married right after high school, and of course is divorced now. I asked about her kids, two of whom are in their 20s... one more still at home. Kids in their 20s! That is so shocking to me! I looked at her and said, "That hardly seems possible!" She looked at me, shocked and said, "Oh come on TRS, we're old!" Hmm. Speak for yourself! I'm still looking for a husband and hoping to have a family! But I guess if you've seen your own children meet so many of life's milestones, it's a whole different perspective. Yikes! As for me, I'm still trying to hit the milestones - like marriage and children! I had the worst Christmas I can remember. A whole week with my mom is just too much! Each day she made some nasty dig, and they all piled up and really hurt me. For example, talking about that friend with grown children, I mentioned that I'm still young at heart, fun loving, don't feel my age - so my mom suggested I'm not acting enough my age. Considering you only see me three times a year, how would YOU know how others see me? You don't even know me! Then my laugh is too loud, and my hair looks better curled, and I paused at a stop sign too long, I'm eating the wrong food, and drinking the wrong water, and all the "obvious reasons" I'm not married, and who I should have married, even though she doesn't know any of the men I've dated. I seriously wanted to go jump off the bridge in -2 weather!! To you mom's out there - watch yourselves. When you think you're just making suggestions for improvement, you're actually making your child wonder if there is anything you like about them, just as they are! It's a good way to wind up wondering why your kids never come to visit. Anyway, I'll never go home for a full week at a time again. It's not worth the pain. This year, I finally sprang for some of the finishing touches in decorating my home. I bought a beautiful sofa in 2012, after saving up for years, so I finally knew what I wanted in terms of color, other small pieces of furniture and such. I didn't really spend a lot... I guess you could say nickel and dimed... but more like $30 here and $80 there, except for the larger expense of an elfa shelving and desk system, and paint -- all of which made my living space beautiful and functional! Looking at my finances though, I maybe should have spread it out over another year, but finally finding what I wanted (which generally involves antiques, which tend to disappear if you don't buy them when you see them!) I justified it with the thought, "If I can't have a husband or children, no family of my own in a house with a yard, I can at least have a beautiful home!" At my age, what's the sense in waiting to have something nice? I should be so lucky as to have some sticky-fingered kiddos to ruin all my nice furniture! After living here for ten years, it's finally so nice to come home to. I can feel proud of my home. So that's my 2013 wrap up, the good the bad and the ugly! Hoping for a little more beautiful in 2014. Realistic or not. As for resolutions, I've found that I don't really settle on my resolutions until Lent. Which I think is just right! I think I've just identified one of the most painful things about being a single adult. It's knowing that there is really no one in the world who really knows you. By age 40, your family doesn't really know you any more. Mine doesn't any way. And if your family doesn't know you, who does? By age 40, if you have your OWN family, then yes, someone gets you. Even if your spouse doesn't really, one of your kids probably does. As an example, as we opened gifts on Christmas Eve, my mom, who is three years a widow - opened a gift and expressed sincere surprise that this one gift was something she had wanted, but didn't even dream she would receive. And quite frankly, it was nothing that remarkable. It was just that one of her children paid attention to what was working and not working in her home, and had listened to her desires enough to know what was wanted. When you're single and childless, ain't nobody making that kind of effort on your behalf! Last year, as my birthday was coming up, a co-worker who is married and has a 10-year-old asked me if I was looking forward to my birthday. In the conversation, I pointed out that birthdays and Christmas are anticlimactic when you're single. No one knows what you'd like and goes out and gets it. People make fun of anyone over age 10 who makes a wish list... and I get that. But those people have spouses who know at least one thing they'd like that would be nice to not have to buy yourself! As I explained this to said co-worker, her world was rattled. "I never thought of it that way." she muttered. Of course not. You live a convenient reality! Even if your husband doesn't know what one small thing would make you feel understood, you probably have a sister-in-law who understands your love of purses or something! Let me be clear. It's not about the gift. It's about feeling understood. It's about feeling cherished. It's about feeling like you matter enough to anyone to warrant more than a blip on their radar. When you're a single adult who buys a plane ticket to be home for Christmas, and the type who only buys gifts when you see something that reminds you of the person you're buying for... and you end up receiving gifts that could have been purchased with anybody BUT you in mind... it becomes very clear, "These people don't even know me. They don't know me at all." When someone buys you a very big, very fragile something - that you can't even take back home with you because it A) doesn't fit in a carry on, never mind that the TSA wouldn't let you bring this huge glass thing on a plane - and B) it isn't going to make it home in one piece even if you bubble wrapped it within an inch of it's life and checked it as baggage... or even mailed it home.... not only is it proof they don't know you, they're not even thinking about your logistics!! How absurd! What is even harder is... gift giving is my love language. At least it was. Then a couple things happened. One, I went through a couple years of unemployment, which cut down on my spontaneous purchases. I was always the type who would be out shopping and think, "SoAndSo would love this!" and I would get it and mail it to them, without even the excuse of a birthday. Just knowing something would brighten a friend's day was enough reason. Well, when I was broke, I had to stop doing that. I was broke long enough that what was once a force of habit, was no longer. The other thing that happened was, I realized that I was spending way too much money at Christmas, buying gifts that my recipients never seemed to appreciate. Perhaps my ability to find the perfect gift was waning... or at a minimum, being wasted on people whose love language is NOT giving or receiving gifts. Realizing that took some of the joy out of my particular love language. That and, as I started flying home for holidays it was too expensive to move all these gifts with me. The first year that I really cut back was really painful for me. I thought my family would think that I didn't care about them. The ugly truth was, they didn't even notice. So I'm dealing with people who don't share my love language. To the point that I had to curb it myself. Talk about stealing joy! What I wouldn't give to have someone in my life (read: husband) to shower with little, tangible I love yous. No, I'm sure I wouldn't get it right every time, but what joy I would get from trying! I have a friend who feels terribly guilty about any little gifts I give her or her kids. In turn, I felt terrible that she always started cooking whenever I showed up! Dear me! You don't have to feed me! Stop cooking! Until one day I realized that preparing food and feeding friends is her love language! (and she's a GREAT cook!) So I pointed out that gift giving is MY love language, and that I wouldn't squash her love language if she didn't squash mine. And we've lived happily ever after! That is what knowing and loving a person looks like. The few people who know how to love me best are not my family. That's okay. It's wonderful even. But that doesn't prevent time with family from being a bit painful. I do wonder what I don't get about them, that hurts them. Sometimes it's easier to think that they don't have those feelings... because I'll probably never figure it out. Maybe, I don't know them at all. Over two holidays I've had my fill of Hallmark channel movies. It seems to be the only channel my mother bothers to watch. No wonder she doesn't understand why I'm single... If that's her persception of how people couple up in the modern world. Me? I'm ready to barf. If only I could meet a man I instantly hate, I'd fall in love in no time! Cue eyes rolling back in my head. Oh these movies are ridiculous. The characters fall in love after a week. The story line never reveals that they have anything in common. And in the end, you wonder what he loves about her... And there's no reason. She's just nicer than the hateful woman she replaced... And pretty. The message is you only have to be pretty and someone will fall in love with you. I've accepted long ago that I'm jaded. I don't think a woman who's remained single passed age 40 could NOT be jaded about dating. Really, I'd be stupid not to be jaded. You can't put yourself out there time after time, get nothing in return, experience unwarranted rejection... and want to keep doing it. I've realized that I'm just exhausted. Like SATC's Charlotte... Exhausted... Where IS he? I'm tired of being optimistic every time there's a date. I'm tired of opening my heart, just enough to let someone in... Only for them to choose not to. Tired of telling my story, explaining who I am, just to be rejected again. About a month ago I realized that I only have one try left in me. Sure, I'll meet whoever. But to try? I must choose wisely. More accurate to my experience, than Charlotte, is Jamie Stemple! "You realize if this doesn't work out, I'm going to have to blow my brains out!" specifically, 18:00 - 20:00, buty I recommend the whole episode! It's flawless! So yeah, jaded is a tough position to be in when one is still earnestly looking for love. You try not to let it show, but you don't know, really, how the world sees you. You hope that somewhere, on your heart, there's a legible mark that explains why your tender side is a bit crusty. Maybe, just maybe, the right person will understand that. I took an extended week for Thanksgiving. There were some family obligations to tend to so I took about 10 days and sprinkled in some work-from-home time as not to use up ALL my vacation time. So I had plenty of time to putter around the small town, and once again my eyes were opened to the differences... not just between living in a city and living in rural America, but in the attitudes there. Of course you can guess, that everyone there is married by 23 or 25, and if not, they have a few kids, possibly with different fathers. And that's considered normal because - hey - how can you not have kids. They just "happen" you know. No one even thinks about waiting for marriage! I wonder what they think of someone who is over 40 and doesn't have kids. I should have had one by "accident" by now! But oh well. I digress. So I'm in the grocery store picking up goodies in preparation of our Thanksgiving dinner. In the aisle, ahead of me, was a mother and daughter... the daughter somewhere between 18 and 22. As her mom went to put something in the shopping cart, the daughter muttered, "Put that on the bottom." as mom was positioned to put it in the cart, and then had to reposition herself to put it under the cart. Mom's adjustments clearly weren't fast enough for the daughter, who repeated, a bit louder and more sternly each time, "Put It On The Bottom, PUT IT ON THE BOTTOM!" The mom did so, then looked up and said, kindly, "I heard you the first time." She said it sweetly, with humor and a balanced touch of reproach, so I couldn't help but laugh. The mom heard me, laughed too then motioned to her daughter and said, "Do you have one of those too? So bossy." "Nope. Still waiting for the husband to turn up so I can start!" They were about to turn the corner and she said over her shoulder, "Just don't look online!" "Oh, honey, I've tried that and everything else. He's no where to be found!" But it struck me, that her perception was that online dating was NOT a place to look! Was it because she's a small town woman and has the idea that only creepers and ax murderers are online? That those looking online can't be sincere? Or that there's clearly something wrong with them, because otherwise they wouldn't have to resort to online dating? I almost laughed because I thought ... look at me? Could I be single this long and NOT have turned to online dating some time in the past 11 years!! Oh - how married people don't understand dating! Clearly, most of us single folks don't get it either. So when I read this wonderful outline of online dating tips from Proverbial Girlfriend, via Veil of Chastity's Quick Takes post... it really resonated with me. I'm not looking right now, because I'm just too tired... but I have to agree with only investing an hour, one day a week into checking your matches and communicating. Sure, you might miss out on an impatient guy, but what would that hurt? Just wanted to share it with all of you because it's beyond brilliant. Enjoy. Well I got nailed on that one! I probably shouldn't have published it, as it was still in a stream of consciousness phase and I see now that I hadn't built to the point I actually wanted to make. My point came to the surface though - in one comment I left on my last post. So I'm getting flamed by those who think I keep some list of grievances - of every slight from someone who never paid me back, or never ever reciprocated a kindness. That's not so. But here is what is real. We are put on this earth to serve one another. If we're all doing that, then by the law of averages, each of us should have at least one act of kindness done to us for every 20 - 100 acts of kindness we put out into the world. Clearly everyone's not doing that. And sometimes it's noticeable. The fact is, couples and parents don't put as much out into the world, because they are focused on their families, and rightly so. They don't spend their energy trying to love strangers, or trying to hold onto friends. Sure, to some degree but not as much as one who is solo in the world. It's their job to grow the love in their own homes. I don't have that luxury. That would be vain. Consider the single person. No one in the world is tied to them in ways that spouses and children are tied by sharing a home, sharing the chores, exchanging hugs and kisses. When we singles show love - by a kind deed, by just getting to know someone new, by going above and beyond... or putting our hearts on the line... yet again, seeking love... more often than not it falls into an abyss. You just did something kind. No one saw it. The one person who felt is going to walk away with it. sure, they may pay forward, but the odds are you'll never see it. You'll never know how you touched someone's life or what it meant. And that's fine. We're not always meant to. Not every kind action is returned. Not every act of love is reciprocated. Think about that. A world in which every action you ever make has no response. Heck, that even defies the laws of physics! Of course we all have friends who stay connected, and occasionally you learn how much you mean to someone. The effort we put into relationships as single people is risky. That relationship may not even be there next week. By contrast, when someone who is part of a family, like a father, a mother, a child - demonstrates a loving act... it is felt throughout the family. Even if it's not acknowledged. When a mommy changes diapers, soothes a colicky child, cooks dinner, does the laundry - there's a rather immediate return on that investment, even if it's just seeing your children in clean clothes. If no one ever says thank you - you know you're feeding your child, supporting your spouse, building a better life. For the perpetually single, there is no one to appreciate that we made dinner. No matter how delicious it was. Laundry? The satisfaction there is just seeing that nothing got destroyed in the process! All the efforts humans make - just to sustain themselves... married people get some satisfaction. Seeing your spouse at the end of the day, knowing all the work you did that day, improved your lives together bit by bit. Watching your children grow, seeing them learn, hearing "I love you mommy." that's a reward. Simply brushing your teeth might result in an appreciative kiss! So don't try to convince me that you love more unconditionally than I do. You're getting something back. Yes, it's intangible. But it's something. It may not be every day - sometimes not even every week. We all go through dark periods, but even in the worst times you're reasonably confident the love is there. Single people get none. So yes... when it becomes obvious that you've showered love and affection and favors and effort - time after time with no reward or reaction - there's nothing wrong with feeling a little spent and a little disappointed. Bringing it back to the parenting analogy - I think the only family-types who could understand are those with autistic children. Those parents love and they serve and they hug (and give up hugging) and sometimes wait a lifetime to hear, "I love you." back. They wait years for a breakthrough smile. That's what I think the single life is like. It's like raising a dozen autistic children. (imagine the frustration and agony!) Everything you do to show love, to make a connection, to see a spark back from the love you're putting out there... just sort of splats off of a flat surface. It's frustrating and hard to bear. Even those mothers mutter wishes about being loved back. That's what my blog has always been about. It's meant to be a window into a different way of life - so that we all might understand one another better and have compassion. So much of the world sees singles as selfish, or non-commital, or as wild partiers with no responsibilities. I write so that sisters, aunts, friends and cousins can recognize some of the pain of the single life. So that the heartbreak can be shared, and hopefully divided. But mostly understood. My previous post wasn't about any one person. It's a bit silly that troops were rallied for a comment that could have just as easily been about anyone. No one in particular. Which ultimately proves my point. "Those who take care of others all the time are usually the ones who need it the most." That's probably truer than I'd like to admit. I'm happy to be the friend everyone knows they can count on. If you need a hand, or a shoulder to cry on... I'm there. In those first years out on my own -- just after college, when most of us were still looking for jobs - I told friends they could call me at two in the morning if they were stranded with a flat tire. I'd be there. I think they knew it too. No one ever took me up on it... not back then anyway. But I remember one night back then when I needed a friend, and had no one to call. I suffered from insomnia back then and in the wee hours one morning, I allowed the worst thoughts and ugliest images to enter my mind. I couldn't shake it. I couldn't pray it away. I longed for someone to talk to, but no one had ever offered me the unconditional assistance such I had offered them. That was when I realized, that is usually the case. Those of us who would help anyone, would never feel right asking for help ourselves. I will say, it changes when you get older. When we were young, most of my friends still lived near their parents so that's who they would turn to first. Soon, many others married, so they had husbands to rely upon. Now, we're quite alone in the world and relying on one another so we'll make the desperate phone call now and then. One friend called me crying. Her car had been towed. Worse yet, she was unemployed and didn't have the funds to retrieve her car. I told her I'd be right there. I found her on a stoop in a strange neighborhood. She had called the impound lot, and learned she needed $260 to retrieve her car. (outrageous!) As we walked back to my car, with plans to swing by an ATM, I considered her situation. I asked, "Can you take that out of your account right now without bouncing checks?" "Okay then," I spoke before I thought it through, "We'll swing by my ATM, and you'll pay me back when you can." She stopped in the middle of the street, looked at me, unbelieving, tears brimming. "You would do that for me?" "Well sure. You can't afford to bounce checks right now, and I can handle a $260 cushion at the moment. It makes sense." Then, once the deed was done, I remembered that I hadn't known her long, and it was possible I would never see her again! But what actually happened... she payed me back within three months. That's a friend who understood benevolence. And who had enough pride not to remain in debt. I have a different friend, who calls me at the drop of a hat to babysit her kids. She once called me at midnight to stay with her kids while she dealt with a minor emergency. I'm happy to help. It may be a little inconvenient for me, but nothing I can't handle. Recently, though, I was struck when I had a quick phone conversation with her - and she didn't ask me for a favor. I suddenly realized she only calls me when she wants something. In fact, after our phone call ended abruptly, she texted me her request, as if it had just occurred to her. It was a request I couldn't accommodate, I told her so and didn't think much more of it. But the next time she called, I waited for the request, and she did not disappoint. I'm starting to recognize a sense of entitlement. Well, this week was the doozy. She needed another favor. Once again for a situation she could have planned for, but once again didn't. A situation in which she really does need help. It's a shame she's worn out the goodwill from many of her friends. This time... she didn't even ask. She just told me what she needed me to do, for several days in a row next week. Then I heard her voice crack, as she realized how alone she was. That she was truly in need, but had perhaps used one person too many. There have been many others who have worn through my good nature. I'm happy to be helpful. Maybe too much so. Maybe I feel that's part of my ministry, since I'm available, I'll help. In most cases it's not an inconvenience. I mean, it IS an inconvenience, but nothing that's not worth doing. I consider it an act of mercy. I do wonder occasionally, if anyone would ever return the favor for me. Yes, I like being helpful. Maybe it's my thing. Maybe I get more out helping than anyone gets from being helped. I learned it from my dad. The countless wee hours that some neighbor needed to be pulled out of the ditch. Opening a rental property to a family whose house burned down. He truly loved his neighbor, even when he couldn't stand them! But there comes a time when limits are reached. And this friend is not the first to wear out her welcome. It's a mystery to me, how some people feel entitled to all the good someone else is willing to put out. I can rarely even ask for the help I need, yet I see others just grabbing. A woman I was once friends with (not anymore) seems to just get showered with goodies. When she wanted to run a half marathon in a major city, someone offered her their condo so she wouldn't have to stay in a hotel. When she saw some sweet baby gifts I was sewing for friends - rather than wait to see if she would get one - she asked me to make one for her. (didn't even really ask - it was a demand disguised as a charming compliment) (Kind of killed the joy of the surprise I was planning.) Somehow, people rally around this woman and give and do for her. And honestly, I've never seen her go above and beyond for anyone. I know she's never done anything special for me. Makes me wonder what her special sauce is. Is it just because she asks? It's uncanny. She's not especially kind. She is outgoing. She has a lovely smile. What makes some people givers and some people takers? Most of my friends have a balance. I'm grateful for that. Note: Someone's feelers were hurt by this post. They really had to go looking for it. For someone who doesn't like what I have to say, they feel a need to check in. What stands out though, if someone finds my observation so shocking - it seems the appropriate response would be, "Oh. I can't believe my actions made you feel that way. Abandoned and used? I'm so sorry." But instead, well, you can see for yourself. I want to share the funniest thing that has happened to me in years. It happened at church this morning. Our priest has been out sick and we have been graced with some wonderful, visiting priests. Since I am active in ministry as a Eucharistic Minister, and as a Lector, (to name two) I may stand out a bit to the visiting priests. Friday was a holy day, All Saints Day, and I went to evening Mass and helped with the Eucharist. The same priest was celebrating Sunday Mass today, and I was on the schedule as Lector. We also had a seminarian student visiting us, who is from one of the towns near where I grew up, so I looked forward to meeting him after Mass. But before that, I had to prepare for visiting the nursing home to bring Communion, by retrieving consecrated hosts from the tabernacle. When I finally headed out of church, most everyone had left. Only the old priest, two ladies who were passing out bulletins and the seminarian student were left in the vestibule. As I approached Father, he extended his arms to embrace me. I figured he was going to thank me for, or tease me about being so visible at church. Instead he exclaimed, "You are blessed! You are so blessed!" "Oh, how nice!" I thought. Hoping he was about to bestow a blessing upon me. Perhaps even reveal a spiritual gift he sees in me. Still hugging me, he said, "Beautiful looks, a wonderful speaking voice.... you are very blessed!" How sweet! I thanked him as we let go of the hug. Then, still hoping for some revelation, I asked, "How about a husband?" "I've been waiting a long time. Could I be blessed with a husband? ", I smiled. He smiled and said, "How about me?" he joked, winked, then quickly turned to leave, leaving me standing, astounded! I called after him, "How is it, only the consecrated men ever propose to me?" He stopped in his tracks and laughed, along with the two older ladies and the seminarian who were nearly doubled over! I continued, addressing the ladies, "That's my only problem. All the men who are interested in me are unavailable!" There's an older deacon, recently widowed, who flirts at me every Sunday. Sure, he's available but I'm having trouble being attracted to men 20 - 30 years my senior! I've always attracted older men. When I was younger, they were married men. Now they're ordained! Sheesh! There are not many songs I can sing in church any more without my voice breaking from emotion. That's one reason I don't join the choir! Who needs my wavering voice in front of a microphone?! After of month of a pesky sore throat and cough, I was so pleased during the All Saints Day Mass to realize I could sing again. I love praising God in song. I have hated being silent. Of course, that was until the choir started the chords of The Summons. I recognize songs I love from the first chords, and I'm sure the people sitting near me can tell when I'm excited.... but this one, I can barely sing. The words hit me so deeply. They hit me because they are truly a test of what I believe and how I behave. Do I really allow the Lord to guide my actions? Sometimes, yes. To this degree? Uh, no. Do I really offer my heart unselfishly? Sometimes, yes. Can I do so without being upset that my feelings and efforts aren't reciprocated? I really can't. Do I offer to help others, even when it's ugly or hurtful? Sometimes, yes. Do I do so with no expectation of being recognized for it? Uh, no. Will you let me answer prayer in you and you in me? Yes, as long as the answer is what I wanted myself in the first place. Ugh. So, I guess I have a lot of work to do. I feel so many hymns so intensely, that I often think how appropriate they would be for my funeral... or my wedding. This song and many others, The Servant Song Lead Me Lord, Here I am Lord, (all of them) I strangely think they would be so good for a wedding. But never sure where in the ceremony it would be appropriate. Won't you let me be your servant, let me be as Christ to youPray that I may have the strength to, let you be my servant too. Hmmm. You can't tell me that my desire for marriage is misplaced. Any woman this devoted to a servant's heart would make an ideal wife and mother. Pity most men can't see that. I'm reminded that my cousin used this song at her wedding (second marriage for both of them ) in the songs leading up to the ceremony. It was perfect. Set the tone without being heavy. Maybe when I'm 50 I'll finally have the chance to use it too! Have you ever noticed that you've been doing something consistently, maybe daily - but you don't even know you were doing it until the day you stop? Every morning when I wake up and trudge to the bathroom to start the grooming process, I stand before the mirror and take a look. I spend a few seconds evaluating what position, height or smooshiness my hair decided to form itself into during my sleep. Ponder any puffiness or pillow lines in my face. Then wonder to myself, "Am I pretty enough for a husband to love? ", "Is this a face a man would be happy to wake up to each morning?" I have no idea when I started doing that. My gut says it began about the time my relationship with Mr. Burns ended. Maybe it was way before that. Perhaps it has something to do with my brother glaring at me across the breakfast table, years ago on a weekend visit, when I had short, layered hair which tumbled and hovered all about my head by morning, and saying, "Sheesh, I feel sorry for the man who will have to wake up next to you." But each morning, after sizing myself up, I have determined, "Yes, I'm pretty. Someone should feel fortunate to see this face each day." Back in my 20s when I was still optimistic on first dates, if I liked the guy, I would take a moment to assess if his was a face I would want see across the dinner table every day for the rest of my life. (it was not so much about how attractive he was, just if I liked his face. Because admit it, there are faces you don't want to see across from yours every day!) I guess I assumed they did the same to me. Well, about a week ago, I stumbled to the bathroom one morning, studied the mirror for a second before thinking, "Who cares? It doesn't matter." That may sound like success. But it was when my BFF said, "Good for you! ", that I realized, no, it's not success. It's not progress. It's something more like despair. It felt more like, "If there is never ever a day in my life that I get to wake up next to my husband, what does it matter if my face is pleasing?" Imagine there's a lovely painting that went straight into a dark dusty attic before ever having an audience, then the house burns down and no one ever got to appreciate it. Does it matter how pretty it was? What care the painter put into each brushstroke? Nope. It's a painting that never fulfilled it's destiny. Calling it a shame is generous. What you mean is that it never mattered. That's one of the things that I struggle with in just my daily life. Everywhere I go, I see couples. Out to lunch, at the mall, even driving down the street. Most places I see couples, I wonder what brought them together. Did they simply find each other attractive? Do they ever even discuss the wonder of God's gifts to the world? Have they ever even been to church together? Do they visit the elderly? Volunteer at the city mission together? Then why do they deserve to have a companion in life? Of course, I know attraction has to do with more than just the physical. But I also realize if a man is ever going to fall in love with me, he'll have to find me attractive first. I don't like to admit this, but sometimes I look at couples and find the wife to be frumpy or homely and it just makes me frustrated. If I'm doing my job of looking good enough, and being dismissed - how did Ms. Frumalump over there get a husband? Hey, I'm not proud of these thoughts - but there they are. It possibly has to do with the emphasis my mom put on always looking my best. As though it's disrespectful to thrust yourself into society without a bit of blush and lipstick. It's just common courtesy to be put together. Why wouldn't you look your best? That's part of the agony of being single during the entire span of your life. You know that your other fine qualities are more important in sustaining a relationship. But no one will ever notice all those fine qualities if they don't notice a pretty face first. Ultimately the pretty face doesn't really matter, and after a lifetime of making sure you possess that okay-looking face, it's a harsh truth to realize. Worst of all, then what? "It is dangerous for American citizens to seek news and information only from sources that reinforce their own opinions." Style Me Pretty ~ aka pure torture for the single! How to become the "Kool-Aid Mom"
NOW I LAY ME DOWN TO SLEEP ~ I pray that one day my photography is good enough to join these volunteers.